We discuss how to stain wood, the materials to use, the cost to do it DIY as well as the cost of hiring a contractor for the job. There is nothing more beautiful than natural wood grain to adorn our homes. Unfortunately sometimes the wood can either lose its natural colour with age or its colour may not match the other hues in our home colour scheme. The obvious thing to do in both these cases is to apply a coat of stain to the wood to enhance its natural beauty or match the piece of furniture into the overall colour scheme. What types of stain are there? 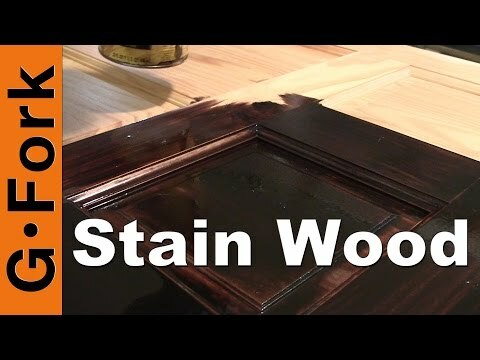 You can make wood-stain from almost any mineral or plant based material but unless you know exactly what you are doing, the dyes or stains will not be suitable or provide a consistent colour for staining a piece of wood. In fact in days gone by, these were the only source of coloured stains or paints that were available. These days we are more fortunate. You can buy from home improvement or decorating stores either oil based or water based stain of almost any colour. Both oil and water based stains have their pros and cons and these must be considered in conjunction with your project. Are slower to dry, giving you a longer working time. This allows you to stain large items such as wooden floors, large furniture, panelling and doors without the stain drying and forming overlap marks. Do not raise the grain when applied to wood. This reduces the need to sand down the grain between coats. Are available as a gel based formula giving you a non-drip stain suitable for vertical surfaces. Do not have the strong odours that oil based stains have. Dry faster, enabling you to apply more coats of stain and the finishing coat within one day. Do not require mineral spirits for cleaning brushes. Only detergent and water are needed. Are available in a much wider range of colours. 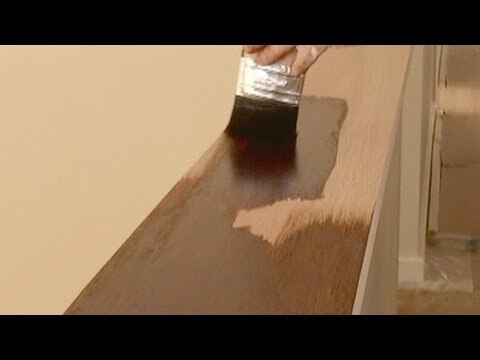 How do you apply wood-stains? Wood-stains are not like paints; they soak into the wood rather than stay on the surface. This means that the wood grain will still be visible after application. Natural bristle brush. Oil based liquid and gel stains apply better with a natural bristle brush than with a synthetic bristle brush. Synthetic bristle brush. Water based stains apply better with a synthetic rather than with a natural bristle brush. Foam applicator. Both types of stains can be applied using a sponge foam applicator, however oil based stains are very difficult to clean from sponges. It is better to dispose of used sponges rather than try to clean them. Remember to dispose of them in an appropriate way complying with your local environmental disposal regulations. Cloth. A lint free cloth is a suitable application tool for all types of stain. If you have a supply of rags then it is probably easier to discard used rags rather than clean them. If you are using an oil based stain, and you need to take a break, enclose the used rag within an airtight plastic bag to prevent the stain from drying out. When applying stain to wood you should always leave time between coats. Each type of stain has different drying times depending on the type and manufacturer. The following table of typical drying times may be of help to you. Follow the instructions given below. Prepare the piece of wood to be stained. Remove any dirt, grease, wax, paint, varnish or polish from the wood. Dirt, grease and wax can be removed using a proprietary wood cleaner (follow the manufacturer’s instructions). These can also be removed, depending on the severity of contamination, using detergent and water or turpentine, mineral spirit (turpentine substitute) and methylated spirits. Wax and polish contamination respond better to methylated spirit. Varnish contamination should be thoroughly sanded and then washed with mineral spirit. Paint contamination should be thoroughly sanded and a proprietary paint stripper used. Paint is very difficult to remove from wood as it visibly lodges within the grooves of the grain. If the paint contamination is severe, a hot, caustic soda bath is probably the only way to remove all traces. You will probably find someone local who specialises in this. Ask in your local antique shop or look online. This is a specialised operation and is extremely dangerous unless you know what you are doing. Always leave this to the professionals. Sand the piece of wood. Using a variety of different grade sandpapers, start to sand the wood until smooth. Wrap the piece of sandpaper around an offcut of wood so you have something to hold on to and the sanding surface is flat. Start with the coarsest grade paper and finish with the finest grade. It is very important to always move the sandpaper in the direction of the grain; this will allow any scratches on the wood caused by the sandpaper to blend into the grain and prevent them from being seen. A general rule is that if the woodgrain is the finished visible surface as with stains, then sand in the direction of the grain. If the finished surface is hidden as with paint then sand across the grain to give the paint something to adhere to. Wash surface between sandpaper grades. To prevent the sanding dust from scoring the wood surface, gently remove the dust using a dry brush, followed by a wipe with a rag moistened with mineral spirit. You will find that washing the wood may cause the grain to ‘rise’. Don’t worry this is perfectly normal. All that is needed is for you to smooth the surface using fine sandpaper. Give final wash. Give the wood a final wash with a rag moistened with mineral spirit (If this makes the grain rise again, just give the surface quick sand using the finest grade paper). Apply wood stain. Follow the manufacturer’s instructions when applying the wood-stain, and leave the recommended time between coats. It is always a good idea to rub the surface with fine sandpaper between coats and wash with a rag moistened with mineral spirit before applying the next coat. Apply the wood-stain in the same direction as the wood grain to prevent any smears or drying marks from becoming visible. Drying. Wipe any unabsorbed stain from the surface. Leave the wood-stain to dry completely and give a quick rub with fine sandpaper and a moistened rag. Apply finishing coat. Check with the manufacturer’s instructions as some wood-stains are already blended with a polyurethane varnish and will not need a separate top coat. If a finishing coat, such as varnish, is required then apply using a soft clean paint brush in the same direction as the grain. Take care that loose bristles do not detach from the brush and stick to the finished top-coat. If you need two coats of varnish, remember to lightly sand using fine grade paper and wash with a rag moistened with mineral spirit. Stains need to soak into the wood grain so require open pores to absorb properly. If you apply stain over a surface already covered with a finishing coat (varnish), the stain will not change the colour of the wood. ✓ After the previous finish has been removed, sand the bare wood lightly and in the direction of the grain. You need to open the pores before staining so start with a medium grade sandpaper (about #120) and work your way to a fine grade sandpaper (about #220). ✓ Stain can be applied using a brush, sponge or rag. Some woods such as oak, mahogany and ash have large open pores. Rub the stain into the pores against the direction of the grain (still keeping your action parallel to the grain) and increase your pressure. This will allow the stain to work its way deep into the grain. Apply a lot of stain and give the wood enough time to absorb the liquid. ✓ Make a note of how long you leave the stain on the wood to absorb before wiping off the unabsorbed liquid. The longer you leave the stain to soak in, the deeper will be the colour. To give a consistent colour, time carefully. Never allow the stain to dry on the surface; this will prevent the clear finish coat from adhering properly. ✓ Remove the remaining unabsorbed stain using a clean dry cloth. Always wipe in the direction of the wood grain to prevent swirl marks from drying and remaining visible under the finishing coat. ✓ If the wood surface is vertical, use a gel stain. This will prevent the stain from running and give you enough time to apply a consistent, even coat of stain. ✓ Wood stain provides colour, not protection. Unless your wood-stain is pre-blended with a varnish, you will need a top finish coat to provide protection. Once the stain has dried completely, apply at least one coat of clear finish (such as varnish) to protect the wood and the stain. The varnish will make the woodgrain and colour even more beautiful than it was before. ✓ Always stir or shake the wood-stain container thoroughly to evenly redistribute any colour pigments that have settled. ✓ Always test the stain you are using on an inconspicuous area to ensure the finished colour is what you expect. Wood is a natural substance and no two pieces of wood will absorb the stain in the same way. ✓ If you need a richer and darker colour then just add another coat. ✓ Remove all metalwork such as hinges and handles before you start. Some stains or varnishes will change the colour of some metals. ✓ Do not try to get a darker colour by letting the stain dry on the surface of the wood. This will peel off when dry and also prevent the varnish from adhering properly. ✓ Never apply the protective finish coat before the stain is dry. The solvent in the finish will activate the stain and draw the colour out of the wood. ✓ If you don’t like the colour, remember that you can always change to a darker colour without removing the original stain, never a lighter one. The cost of stains, finishing coats and sandpapers will vary depending on the quality and brand. Here are some examples of typical prices. Note that stains and varnishes also come in 1 gallon containers. Oil based interior stain. 1qt $8 150 sq. ft.
Clear polyurethane (oil based) interior/outdoors protective finish. 1qt $20 125 sq. ft.
Clear polycrylic (water based) interior protective finish. 1qt $15 125 sq. ft.
Pre-stain wood conditioner. Oil based. 1qt $50 125 sq. ft.
Fast drying polyurethane for hardwood floors. 1 gal $90 700 sq. ft. Always read the safety information supplied by the manufacturer and follow the advice carefully. Some wood-stains and finishing coats give off strong fumes so use in a well ventilated area and do not smoke while using these. Dispose of empty containers, brushes and rags thoughtfully using the appropriate recycling centre in accordance with your local environmental regulations. Wear suitable personal protective equipment when applying wood-stains and varnish.